I am going to finally get one of these. I have always regarded these as marketing hype so this will be an expensive experiment. It seems this one has all the bases covered except an actual Brazilian fretboard. Congratulations! I think you'll be happy with it. Of course, buying via the internet is different, you'll never know for sure until you have it in your hands. Yeah, some of it is hype. Hide glue and historic composition plastic don't do much, other than allowing them to call it "true historic". But, just the overall quality of the instrument, the finish, the top, long neck tenon, proper neck angle, PAF's, neck profile, all together just make them fantastic. It's just a great instrument. Hope you enjoy it. Post some pics when you get it. I know there are lots of people here with numerous Les Pauls and Strats. I consider myself lucky to have one real nice Les Paul and SG. There is no way I could afford the guitar you are getting. But if I could ... I would buy EXACTLY the guitar you are buying. In my book, a truly excellent pick! I am super excited for you, and your choice of guitar! "Laughing out loud with fear and hope, I have a desperate plan..."
Looking forward to getting this soon, hopefully by Columbus Day weekend which is my birthday. Check out the inventory at Wildwood. They still have some really nice RO's in stock. 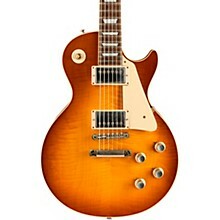 Guitar is arriving today, looking forward to being "Wowed" hopefully. I hope it exceeds expectations! Pics are mandatory, of course. FedEx shipment stuck in Memphis. They left me waiting and waiting with no email. I had to call 4 times to finally get an answer. Shipment ended up in Boston. After many calls and some screaming FedEx delivered the guitar at Midnight Friday night. I was tired but anxious to see what is was like. I was first disappointed with the color, it was less ambered from the pictures online. It is still very nice and I'll have to get used to it. Acoustically it is vey lively in my hands. Compared to my 2001 LP Classic there is not much difference at low volumes but when I cranked the amp it really came alive. I dont think the price difference is really justified but I am glad I now have one of these historics.Sorry no pictures, I am tired of not being able to easily post pictures here. Just played it again at higher levels. It really comes to life differently than my other 2 USA Les Pauls. I am going to try it soon in my studio through my Marshall 1959HW and 1987X in stereo. I think it may really surprise me. I noticed something strange. The plastic pick guard bezels are way too high. The top of the Chrome pick up covers themselves are slightly below the plastic. This is a bit cumbersome to play as my pic keeps hitting them. Am I to assume this is the way they made them in 1960? Do you mean the pickup rings? They are taller on the RI's. On both of mine, the pickups are just barely above the top of the rings. That's how they came from the Custom Shop and I haven't felt the need to adjust them. ...The top of the Chrome pick up covers themselves are slightly below the plastic....Am I to assume this is the way they made them in 1960? If this keeps bothering me I think I will shave them down a bit. 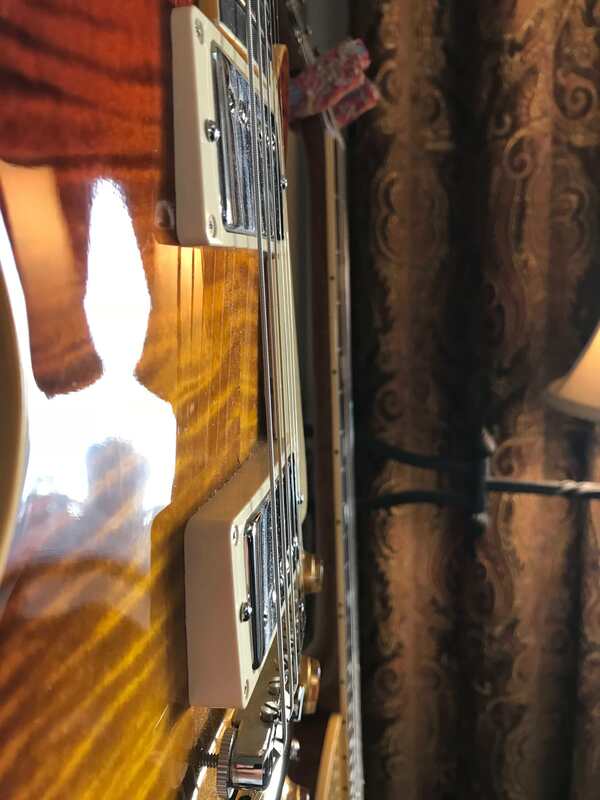 It would probably be a better idea to buy regular Gibson USA style rings which are lower than the Historic ones and keep the originals in case you ever wish to sell the guitar. Up to you to decide, of course, but if I was in your position I wouldn't ruin the originals. Maybe just raise the pickups a bit. They are already as close to the strings as I want. What is it showing exactly?